August is here, and the zoo is celebrating with a whole month of summer fun. Here at the zoo, A isn’t just for August – it’s for Animals, Anniversary, and Advocacy. Throughout this month, be here to learn about and support our conservation efforts, celebrate our 48th birthday, and experience our special editions of Keeper Talks. 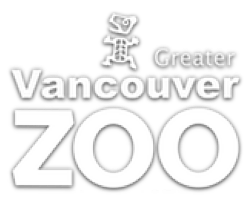 All through August when you donate $10 or more to the Greater Vancouver Zoo, you will receive a special edition Western Painted Turtle “We’ve got Your Back” t-shirt. With your support the zoo can continue our conservation efforts, including our western painted turtle and Oregon spotted frog recovery programs. When you get your shirt, we encourage you decorate it! The design is based off the western painted turtle so it gives you lots of room to paint a unique design on the shell. When you are done, share your masterpiece with us on social media to be entered in our t-shirt decorating competition! On the August 18th – 19th weekend, the zoo is celebrating our 48th birthday! We are filling the days with non-stop celebration – from family farmyard feeding to a bouncy castle and live music there are tons of activities that you won’t want to miss. With a purchase of a package of vouchers, you and your family can have access to all these activities and more. On these special days, we are also hosting a turtle t-shirt painting party where you can decorate your “We’ve Got Your Back” t-shirt and help us celebrate the release of our western painted turtles. Each week throughout August the zoo will be showcasing one of our animals and their conservation story. On Saturdays and Sundays, our keepers will give conservation themed Keeper Talks about that week’s featured animal. You will get special insights about the animals’ backgrounds and personality, all while learning about how you can help local conservation efforts! August 4-6: Black Bear Cubs, enclosure 21. To accompany August events, we are also giving our guests a chance to win once-in-a-lifetime zoo experiences through three different contests! With weekly quizzes, t-shirt decorating competitions, and photo contests there are many chances for you to win big! Be here to celebrate August, Animals, Advocacy, and our Anniversary with us. These once in a life time experiences are activities you and your family won’t want to miss out on!